Blackberries are a delicious fruit that can be used in many ways. For example, you can throw a few blackberries in your morning cereal, oatmeal or yogurt. If you are following a low-carb diet, though, you may want to skip the breakfast cereal, oatmeal and even the yogurt, but you can still have the blackberries because, like all berries, it is one of the fruits with the lowest carb count. There is a distinction between carb count and net carbs. The carb count refers to the total amount of carbohydrates present in a serving of food, which includes starch and sugar as well as fiber. However, most people tracking their carbohydrate intake, whether it is to optimize their blood sugar levels or to lose weight, track their net carb intake. Net carbs correspond to the portion of the carbohydrates that is digestible and usable by the body, or the sugar and the starch. Therefore, to calculate the net carbs in a serving of food, simply take the grams of total carbohydrates minus the grams of dietary fiber. A cup of blackberries contains 62 calories, 13.8 grams carbohydrates and 7.6 grams fiber, which corresponds to a net-carb content of only 6.2 grams, according to the USDA National Nutrient Database. If you have a half cup of the berries, the nutrition facts for this smaller serving are 31 calories, 6.9 grams carbohydrates and 3.8 grams fiber, for a total of only 3.1 grams of net carbs. 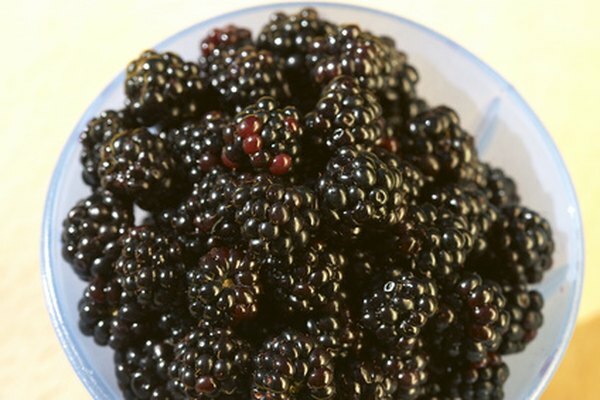 If you have frozen blackberries, once thawed, the same volume contains a larger number of blackberries. In the case of thawed blackberries, a cup contains 97 calories, 23.7 grams carbohydrates and 7.5 grams fiber, which is the equivalent of 16.2 grams of net carbs. Most berries have a low carbohydrate content. For example, a cup of raspberries provides 64 calories, 14.7 grams carbohydrates and 8.0 grams fiber, or about 6.7 grams of net carbs; a cup of whole strawberries, 46 calories, 11.1 grams carbohydrates, 2.9 grams fiber and 8.2 grams net carbs; a cup of blueberries, 84 calories, 21.5 grams carbohydrates, 3.6 grams fiber and 17.9 grams net carbs; and a cup of whole raw cranberries, 46 calories, 12.2 grams carbohydrates, 4.6 grams fiber and 7.6 grams net carbs. Lowering your carbohydrate intake by consuming fewer grain products, starchy vegetables, high-carb fruit, juices, milk, yogurt and sugar could be beneficial not only for your weight but also for your health. A diet limiting daily carbohydrate intake to less than 20 grams a day initially, but with a slightly higher carb intake thereafter, could result in greater weight loss as well as improved blood cholesterol levels compared to a low-fat, calorie-restricted diet, as reported in the "Annals of Internal Medicine." How Much Sugar Is in Plain Yogurt?